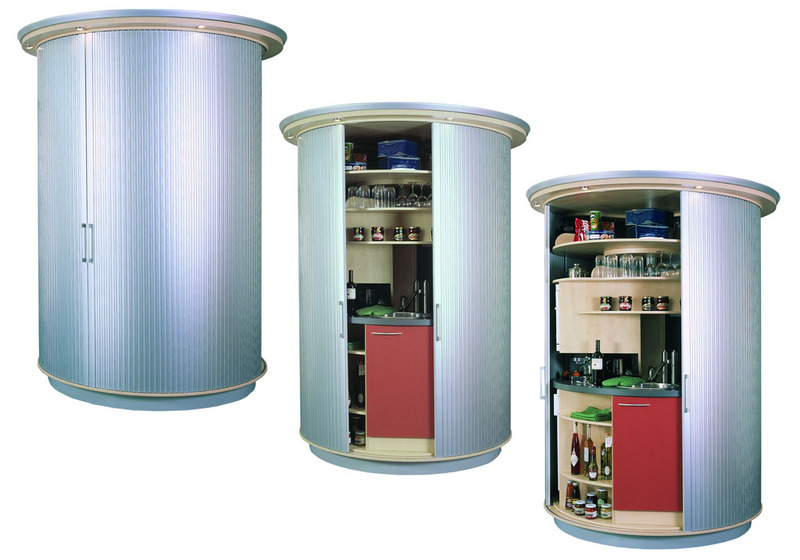 New Zealand-based CC Concepts sends the Clever Kitchen to the rescue. 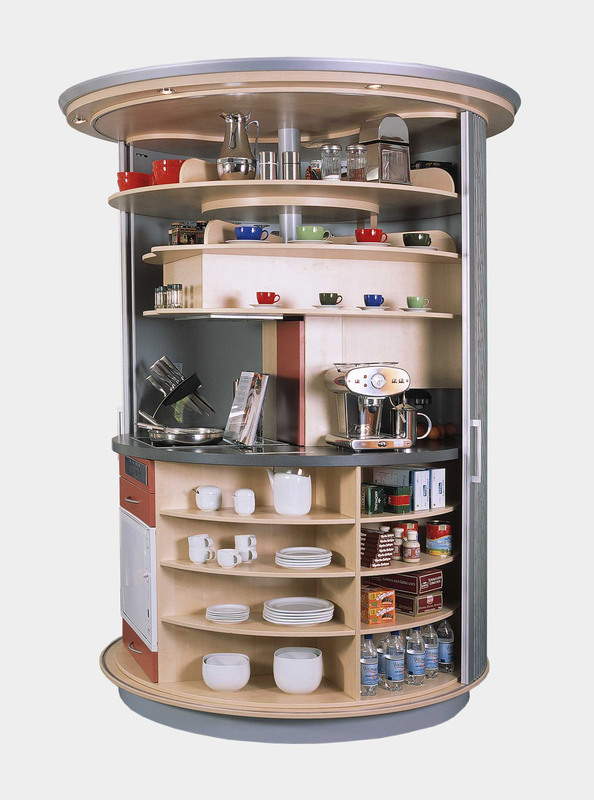 The kitchen itself is a column-shaped unit and contains as much equipment and storage space as a regular kitchen (OK, almost), but takes up just 19 square feet. As it can rotate 180 degrees, you can place it almost anywhere. It also features a built-in screen, which can cover the whole unit. 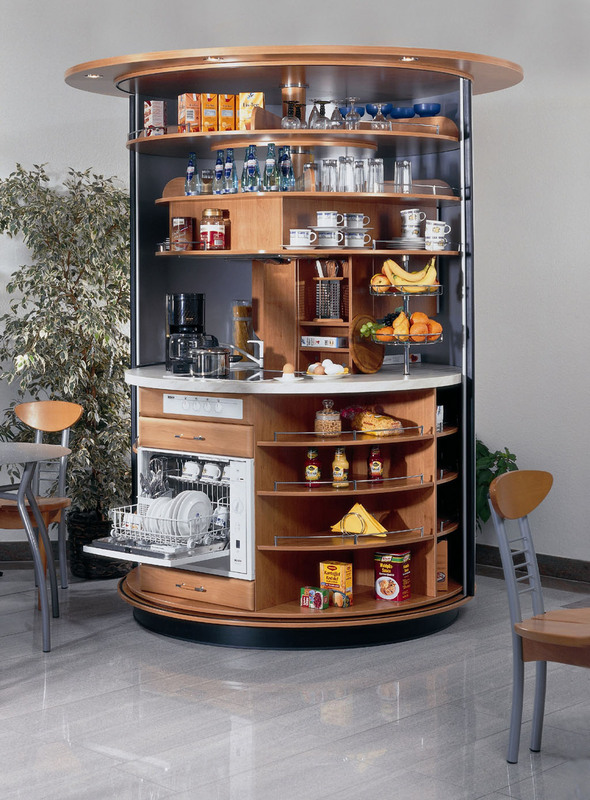 As I saw on their website, the kitchen comes in a variety of configurations – so you can have one kind in your home, another in your office. Less is more, often said but even more true. 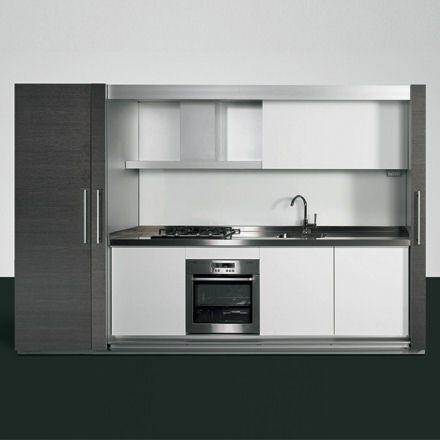 The Tivali kitchen from Dada is a fully featured but self-contained kitchen which can disappear instantly thanks to its disappearing doors. 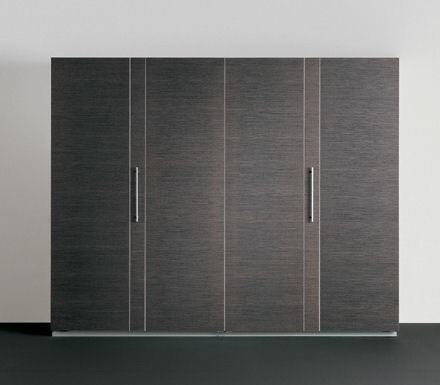 Even better, you can place it just as you would do with your kitchen, but you can also use it as a room divider. 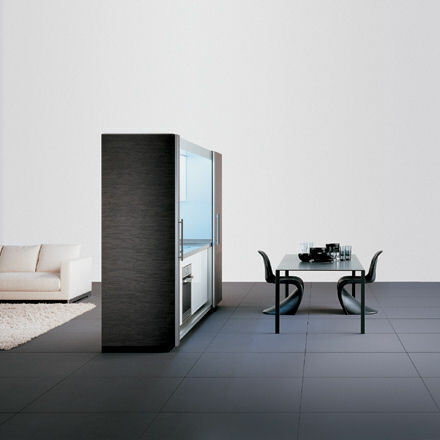 Of course, it’s available in different configurations, with different appliances and finishes to match your needs and your room. 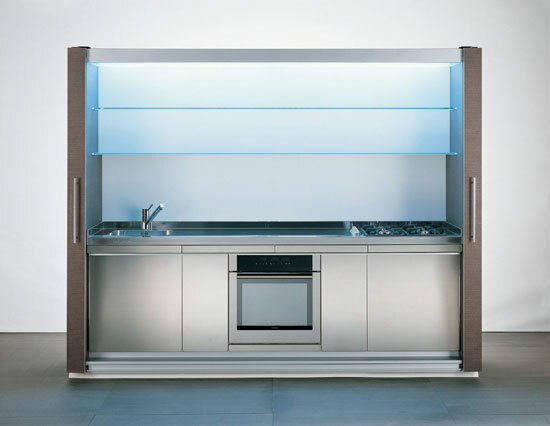 The Tivali unit usually features a stainless steel workbench (I likey!) 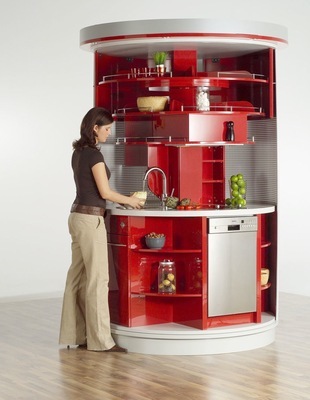 with build-in sink and hob, drawers, heat-sensing spot-lights and built-in appliances. 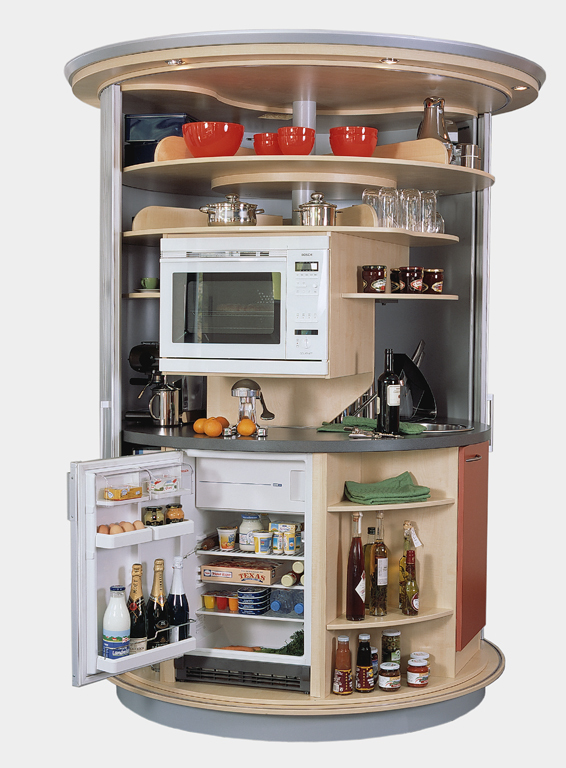 If you add the optional fridge column the Tivali incorporates every cooking need from start to finish. It may sound as the title of the latest video-game, Grandma’s Revenge is a concept kitchen from Prof.Klaus Michel at the department of interior design at the University of Art and Design Halle, Germany. Grandma’s revenge is both a kitchen and a dining room, all in only 4 square meters. When closed, it portrays two dimensional view in a dining room scene. The outlines show a table, two chairs and a lamp in a minimalistic way. 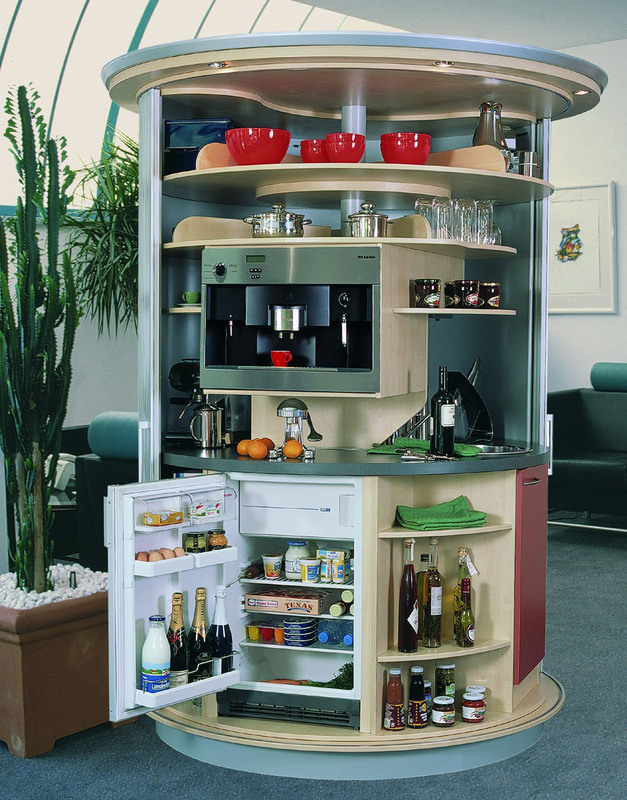 Grandma’s revenge contains various mechanisms to change its appearance: a horizontal folding door opens up to the whole kitchen – which consists of a cooking area on the right, a combined dishwashing facility and a chopping board are on the left and the desk in the middle. All of the appliances like the oven, dishwasher, refrigerator and the storage boards are set in drawers below the working area. The desk, chairs, and lamp can be pulled out up to a width of 1.1 meters. 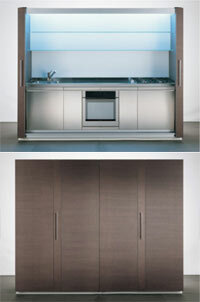 The folding door can be closed to hide the cooking area to create a dining room. You don’t even need to clean the table right after dinner: just push the table, close the door and tidy up next morning. If you had a small apartment or house, would you choose any of these? 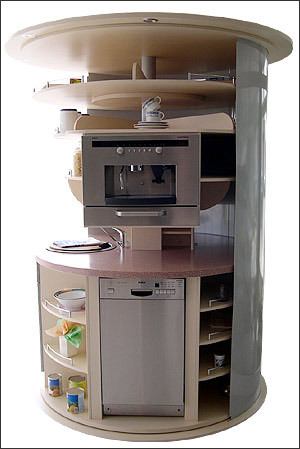 If I had a small apartment or house I would find a good kitchen designer to help me maximize the space. You’d be surprised what we can do. 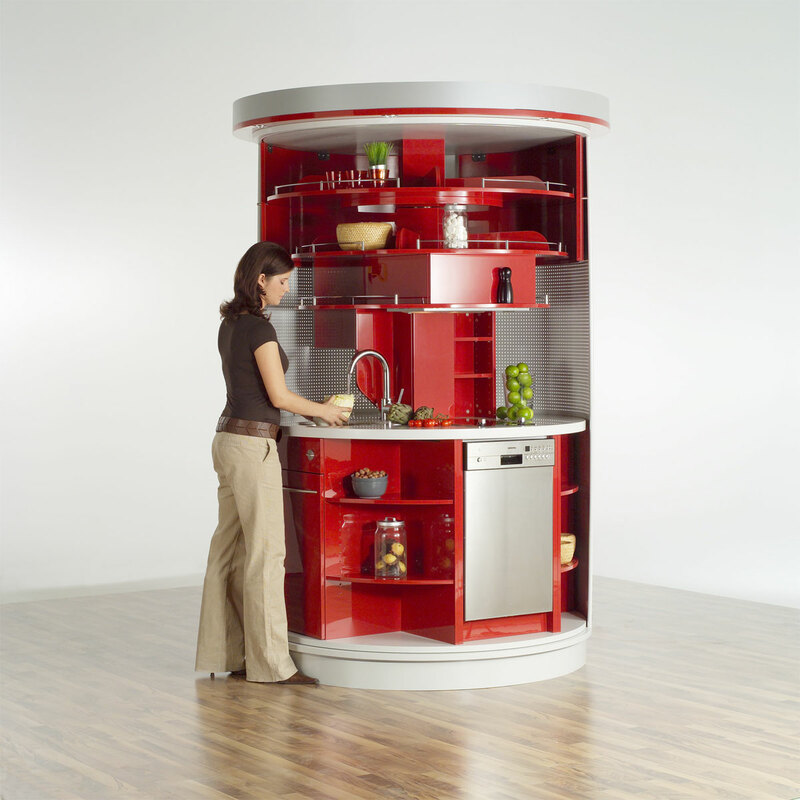 The premade compact kitchens may be intriguing, but they won’t fit your residential space like a custom designed kitchen will. 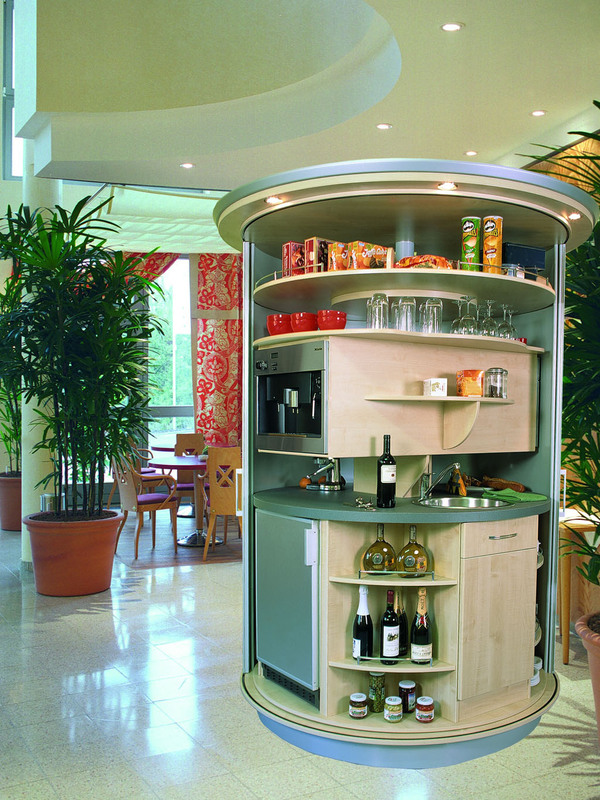 I think they are more appropos for office kitchens where they can fit into a lunch room or warehouse space. They also lock you into their customized appliances if you need a replacement. 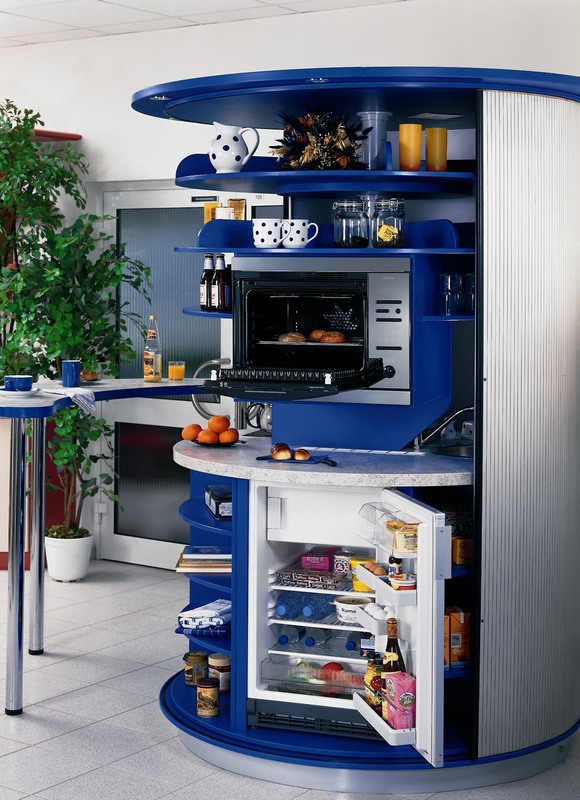 I would like to know where I can find a close up kitchen like this. But can’t contact anyone. I think you can check out the homepage of these kitchens’ manufacturers as a start… where do you live? We are building an apartment inside of a metal building. My kitchen size will be only 14 x 10. I’m thinking gallery with an island. 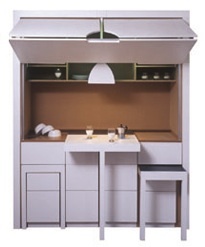 What is the minimum walking space between cabinets? This concept is absurd, in no way could this be useful. 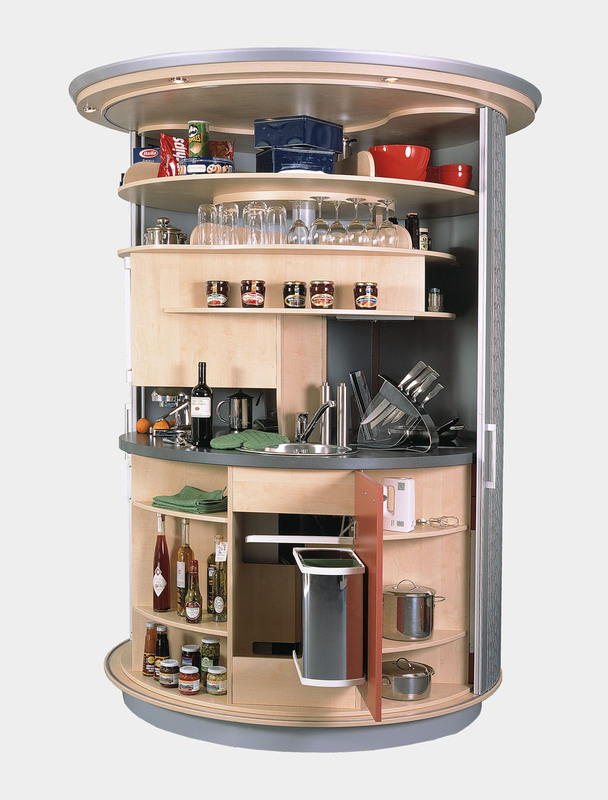 Imagine actually using it and you would be so limited to space within the kitchen itself. 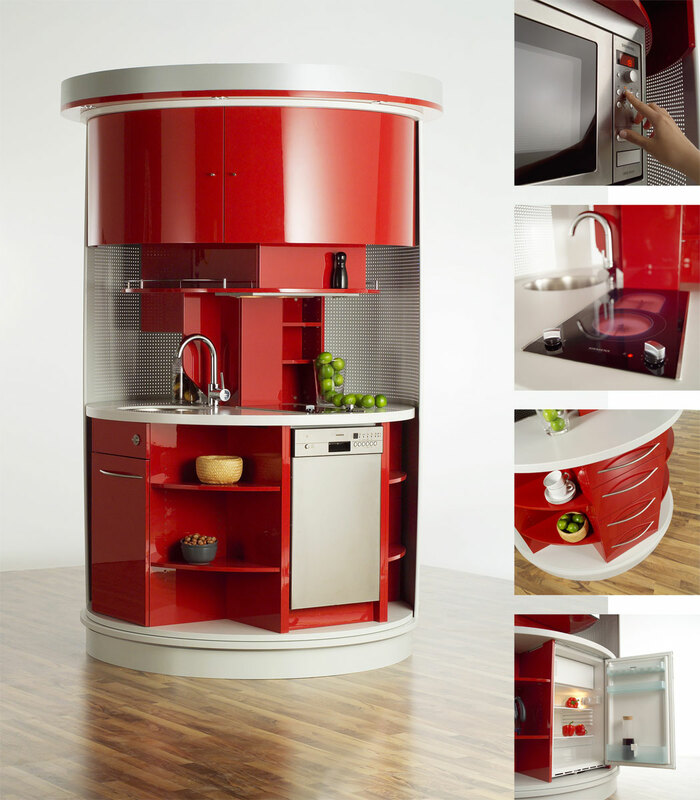 Also this has to be expensive, designing your own kitchen would prolly be cheaper! 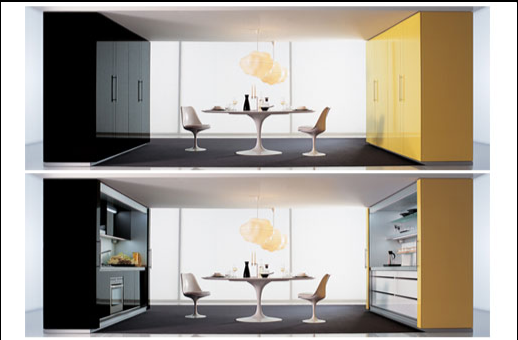 Mgs Decor India based home Modular Kitchen and Furniture in Chennai. 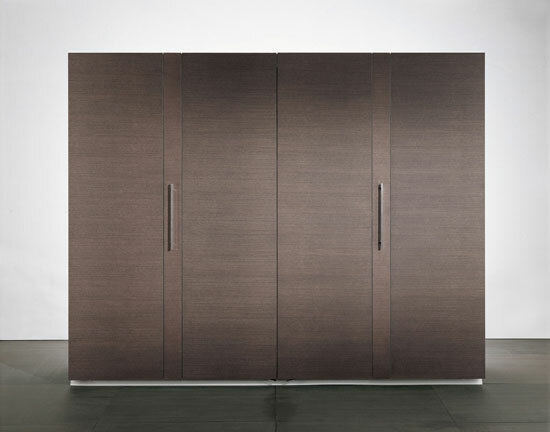 We are providing all kind of Modular designs. I’m having trouble finding you on cardsapp, how can I find you? I’m curious to find out what blog platform you have been utilizing? I’m experiencing some small security problems with my latest site and I’d like to find something more risk-free. Do you have any recommendations? This in itself increases your chances of success significantly. ex boyfriend say, however don’t be too desperate. everybody close to you that you have self self-confidence and you are satisfied with by yourself. Appreciation to my father who shared with me concerning this website, this webpage is truly remarkable.